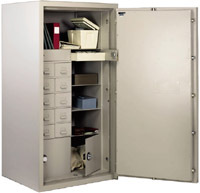 High Security Safes. Gibraltar, a name synonymous with strength and security throughout the world, means the same when applied to Meilink safes. The Gibraltar series combines the very best features available for security and protection. That's why jewelers and financial institutions throughout the world rely on Meilink Gibraltar Safes to meet their security needs. The TL-30 rating means the safe is designed and tested to withstand double the attack time as the very respectable TL-15.